Injuries are a leading cause of disability for people of all ages – and they are the leading cause of death for Americans ages 1 to 44. But many injuries can be prevented when people practice safe behaviors. Make a difference: Spread the word about strategies for reducing the risk of injuries. Encourage communities, workplaces, families, and individuals to identify and report safety hazards. 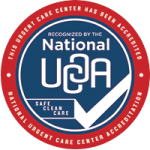 For more information visit Advanced Urgent Care in Brighton, CO or call 303-659-9700.